It seems like I am on an Indian-Authors-Only reading spree. 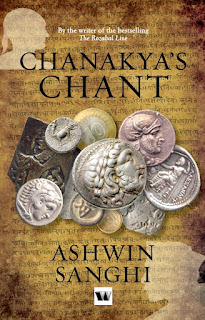 Almost finishing "Chankya's Chant" & knowing about him I can now say, I belong not only to the land of great mathematicians & senseless rule-makers but also to the land of a great Strategic Consultant!! The book beautifully toggles between two eras.The first one being centered around 240 BC talking about the story of the actual Chankya, how his initial sufferings which led to a motive of revenge & his immense intelligence led him to do the then impossible task of uniting Bharat. The other being in the current era, where not just another man, but supposedly a re-birth of Chankya, Pandit Gangasagar, plays in the modern politics, thinking steps ahead, makes a Prime Minister out of a mere slum girl. Perfect read, as it combines & clearly shows the aspect of the working politics! & at the same time, throws a much-deserving light on an important chapter of our history, which we hardly remember about. A gripping 2nd novel by Ashwin Sanghi, who wrote his 1st novel The Rozabel Line, a fiction about the not so-confirmed time when Jesus lived in India under his pseudonym Shawn Haiginis. Somehow this combo of Indian Author + fiction around a known religious myth/history, seems to take some good place in the Bestseller list.Good time to be an author, specially if you are a top B-School alum, atleast as per the latest trend, all started by our very own Chetan Bhagat. And the boom of e-bookstores in India is definitely helping your case. P.S As my status changes from Waiting for Results to Wait-Listed for Results, & work takes a front-seat by not only ruining weekdays, but extending its presence over to the weekend (so much for boasting about my No-Work Status all along :|) I guess it is time to get the book-worm in me back to action.